If you love warhead candy you are going really love warheads jelly beans. 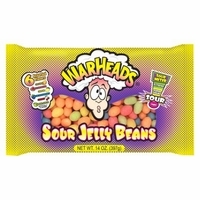 Each bag comes in assorted warhead flavors Black Cherry, Apple, Lemon, Watermelon and Blue Raspberry. Be prepared with these bite size chewy jelly beans they pack a great sour blast.